Overview - Dynamic Denzel Washington joins Hollywood favorite Gene Hackman in this intense action thriller that's a smash hit with audiences and critics alike! In the midst of a global crisis, the USS Alabama receives an unconfirmed order to launch its nuclear missiles-signaling the start of WWIII. The tension quickly rises as the sub's respected commander (Hackman) and his brilliant executive officer (Washington) clash over the validity of their orders battling each other for control of the sub! As this epic struggle rages under the sea, Crimson Tide brings motion picture excitement to a new level-and you to the edge of your seat! Robert DeNiro and Al Pacino sat together in a diner in 'Heat.' Leonardo DiCaprio and Daniel Day Lewis squinted across a battlefield in 'Gangs of New York.' Brad Pitt aimed a trembling gun at Kevin Spacey in 'Seven.' Great actors are few and far between, but when they clash in a battle of wills, it can make for some truly memorable movie-watching experiences. A '90s action film like 'Crimson Tide' isn’t often listed among the dramas I’ve just mentioned, but like those other films, it features an unforgettable climactic showdown between two Hollywood heavyweights. When ultranationalist rebels overtake a nuclear missile facility in Russia, American submarines are dispatched to the nearby waters in case the escalating crisis can't be averted. When the rebels begin fueling their missiles, the USS Alabama is given an order to fire on the facility. Shortly afterwards, as the Alabama begins receiving a follow-up communication with possible stand-down orders, an enemy sub attacks and knocks out radio capabilities. 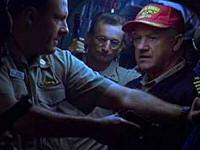 With only half a message in hand, the captain of the boat, Frank Ramsey (Gene Hackman) is convinced that the situation dictates adherence to the original order, but his XO, Lt. 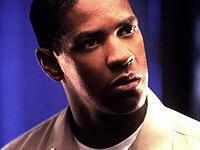 Commander Ron Hunter (Denzel Washington), believes the launch should be delayed until the second transmission can be completed. Ultimately, the two square off in a battle of wills that results in a startling mutiny, forcing each member of the crew to choose a side. What makes 'Crimson Tide' so intensely satisfying is not the clash of lumbering submarines, but the fight that erupts between Hackman and Washington, who both deliver stellar performances in what might otherwise have been a fairly standard wartime action film. The conflict between the two men escalates convincingly, never feeling contrived or unnecessarily complex. 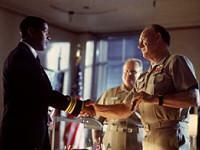 Instead, director Tony Scott ('Enemy of the State,' 'Deja Vu')keeps his focus on the opposing viewpoints as the two men lead the crewmembers on each of their sides. The supporting cast is also top-notch, only giving the conflict added tension and potential fallout. There are no villains or saboteurs on the Alabama. Every character has a family, a great love for their country, and a strict loyalty to their duties. Every character believes they're acting in the best interest of their country's safety, making 'Crimson Tide' a cautionary tale in which either side could be right or wrong. I've always been fascinated by the will power needed to be a part of the military -- it must take a great deal of effort to suppress one’s own judgment and follow the orders of a commanding officer. I understand individual thought could cripple a fighting force, but I know it's an ongoing struggle many soldiers must face. To see that internal struggle represented so vividly on screen is both thrilling and frightening. Am I looking too deeply into this classic Jerry Bruckheimer production? Am I overstating the value of this '90s film? Maybe. But 'Crimson Tide' doesn't get distracted by its own action beats or subplots -- it's a focused drama that places two men in the center of a hurricane of will. In the end, I can't help but love an actioner that engages the heart and the mind with this level of storytelling. 'Crimson Tide' is presented with a sharp 1080p/AVC encoded transfer that makes its previous standard definition incarnations irrelevant. The palette is generally subdued, but colors remain stable and primaries are incredibly bold when they wash over the image (compartments in the submarine flooded with red light look particularly striking). Detail is quite good and much better than I expected. I thought the shadowy sub would drown out facial textures and fine details, but the results are quite the opposite. The hair on Hackman's dog is crisp, dials and switches are easily discernable, and the myriad of on-screen text is crystal clear. Better still, the picture wasn't cluttered with source noise or artifacting, both of which were a serious problem on the film's standard DVD releases. The transfer's only flaws come in two flavors -- minor edge enhancement and middling black levels. While it's not a frequent problem, thin edge halos appear during high contrast shots, occasionally making actors appear superimposed onto the backgrounds. More problematic are the dozen or so scenes in which the dark confines of the submarine register as dark gray. Depth takes a small hit and the three-dimensional quality of the picture is weakened as a result. Overall, 'Crimson Tide' looks substantially better than it ever has on DVD, but still isn't as impeccable a transfer as it could be. The audio, on the other hand, is pretty exceptional from beginning to end. 'Crimson Tide' features an immersive PCM 5.1 surround track (48 kHz/ 16-Bit/ 4.6 Mbps) that benefits from powerful dynamics and aggressive surrounds. Low-end explosions are thunderous, while subtle use of bass -- the drone of the engines and the echo of distant underwater events -- is effectively ominous. Dialogue is clean and nicely prioritized, fitting perfectly between the unsettling silences and more intense action beats. When the soundfield springs to life, the rear surrounds are effective and efficient -- rain storms, radar sweeps, and boots pounding against the structure of the sub are all quite convincing. This is a very lively track that matches the tone of the film. If I have any complaint, it's that more subtle acoustics (especially on the bridge and in the crew quarters) aren't as engaging as in other submarine films. In fact, there are many times when the rear channels are surprisingly quiet during bouts of heated dialogue, leaving words and music as the sole elements in the soundscape. Still, this is a relatively small issue that doesn't come close to ruining the experience. Everyone should be extremely pleased with the impressive PCM track on this catalog release. 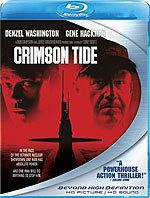 The Blu-ray edition of 'Crimson Tide' features the theatrical cut that appeared on the original, barebones DVD. However, it ports over all of the special features from the Unrated Extended Cut DVD released in 2006. While I'm happy to report that Disney didn't short change fans on supplemental content, I'm surprised the studio didn't include both cuts of the film ala 'Bad Santa.' Worse still, the back of the box suggests that the features are presented in high-def, but they're actually presented in low quality 480i/p. The Making of Crimson Tide (SD, 20 minutes) -- For a twenty minute mini-doc, this featurette is really just a standard EPK pat on the back that doesn't delve into the intricacies of the characters or the shoot. I did enjoy seeing interviews with the cast and crew, but they basically just recap the plot and provide only a handful of interesting tidbits about the production. All Access: On the Set of Crimson Tide (SD, 11 minutes) -- This shorter featurette includes less fluff, but still fails to truly explore the making of the film. It's decent, but a documentary or a commentary would do the film far better justice. Deleted Scenes (SD, 7 minutes) -- Sadly, Disney has only included minor extensions and alternate takes rather than the extra seven minutes that comprises the additions in the Unrated Extended Cut. 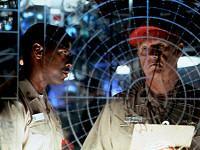 I sense another high-def release of 'Crimson Tide' looming on the Blu-ray horizon. 'Crimson Tide' is an actor's film that hinges on characters and story, rather than action beats and explosions. The film pits heavyweights Denzel Washington and Gene Hackman against each other and really lets them show off everything they've got. The Blu-ray edition of the film is impressive as well, featuring a great video transfer that easily bests its DVD releases, as well as an excellent PCM audio track. Alas, the biggest flaw is the exclusion of the Unrated Extended Cut that appeared on DVD in 2006. While I would normally recommend a title of this caliber (with or without special features), the threat of a future Blu-ray double-dip edition should give frugal buyers pause.